Search Results for "nasal spray"
Silhouette Afro american doctor presenting nasal spray. Sick Man With Runny Nose Are Using Nasal Spray And Sneezing Loudly. Sick Pair With Runny Noses Using Nasal Spray And Sneezes Loudly In Living Room. 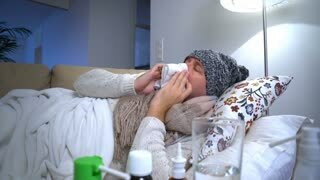 A Woman With Fever And Runny Nose Uses Nasal Spray And Sneezes Loudly. Dolly. Medicaments and pharmaceutical concept - Male doctor or pharmacist holding nasal spray and saying to camera something. Man with fever and runny nose using nasal spray and sneezes loudly. Ill senior man using nasal spray in bed. Smiling physician or medic presenting nasal spray on white background.